hello everyone my daughter is getting her license soon and she likes elcominos. im thinking of getting her one 78-87. it would be something we could maintain together, she loves to help me with my 66 impala. but she will need to use it to drive about 30 miles a day to go to school so im wondering what these usually average for mileage i know a lot of them came through with 305's. or maybe i would be lucky enough to find one with a v6. thanks for your help. I can't tell you what your mileage would be exactly with either motor. If you get a 305 with a 4 barrel carb, it could actually get better mileage than with a 2 barrel if she keeps her foot out of the throttle and doesn't engage the secondaries. I can tell you don't get one with the Buick 231 V6, get the Chevy 229. The 231 had problems with spun bearings. I had a 229 in my '83 Malibu wagon and it had decent power and got pretty good mileage, though I don't remember the exact mileage. 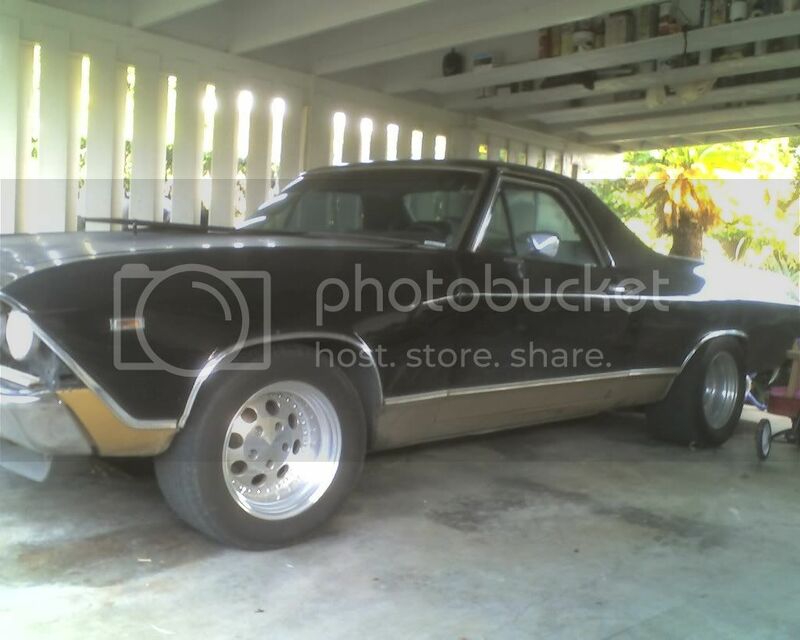 My El Camino was originally a V6, but had a 350 in it when I bought it. I had another 350 built for it and added TPI fuel injection to it and have gotten as high as almost 30 mpg with it. Love the Ferris Bueller reference, by the way. Hello, I am new to the forum. I have a 1984 Caballero and I was thinking about getting it fuel injected. It has a 350 long block. Do you have any reference of where I may purchase the conversion system or any advice? Any input would be much appreciated. Depends on what fuel injection : TPI or TBI. Either or both can be found on summitt.com or Jegs.com . 2010 VW Jetta S/W, 2.5, 5-cyl,6-spd auto. I'm wanting to go with the TPI. Are there any specific set ups that need to be used with the engine? And what would be the cost range I would be looking at. thanks for the info. i wasn't aware that chevy had its own v6 (or at least i don't remember lol) back then. i remember the turbo 231's would over heat and cook the bearings. the late 70's turbo trans am's had the same issue. Fuel injection conversions can vary greatly. I did the conversion using a GM system from an '86 Vette and an Accel computer that omitted the speed sensor and changed it from a Mass AirFlow system to Speed Density. In retrospect, I should have just bought an aftermarket harness and used the factory computer with a custom burned chip. That would have been the cheapest way to go and probably would have worked better. Mine runs well, but could be better and I need another person (to make changes in the program or operate the car) and a chassis dyno to get it right. v6 with a slapon fuel injection and tall skinny tires would probly get you close to good.